Make-A-Wish Eastern North Carolina grants life-changing wishes for children with critical illnesses who are referred to us between the ages of 2 1/2 and 18. Our awesome Wish Kids live in our 49-county service area. 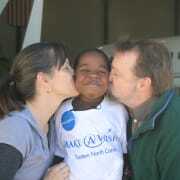 Once a child is eligible, volunteers and staff take care of every detail to grant the child's most heartfelt wish. We serve approximately 200 wish kids a year and have over 300 volunteers across our territory helping us grant each magical wish! Our office is located in the North Hills area of Raleigh. Would you recommend Make-A-Wish Eastern North Carolina?